Hey all my local Edmonton VMUG people! Registration is now open for our next VMUG, on Tuesday June 16. Scalar with Nutanx – and I’m sure there will be many questions about Nutanix Community Edition! We’ll also be dragging someone kicking and screaming (sounds like me) to do some talking about some Tales from the Trenches again and things we’ve run into and seen. Maybe you’ve run into them, maybe you haven’t. Maybe you have some to share. If you have some notes that you’re not willing to present, do reach out to me, I’m happy to present them to the crowd on your behalf. I just wanted to help spread the word on something Rick Byrne, my fellow Edmonton VMUG Leader decided to kick off yesterday. Details can be found at his blog directly: http://rickrbyrne.wordpress.com/2014/04/23/want-to-present-at-a-vmug-feedforward-can-help/, but I’ll quickly recap. Some time ago, Scott Lowe talked about presenting and how he’d mentor people too uncomfortable, afraid, etc, to speak publically at a VMUG. Because we all know it’s not that we have nothing to say – we just don’t want to stand up front. Heck, I’m one of the Leaders and I try to avoid it unless Rick pushes me in front to of the bus. Over time, I’ve realized it’s not that bad, just something to get used to. But if you had someone who does public speaking and presentation like a Sales Engineer (Rick) or a more recognized public figure (eg: Scott Lowe) you’d not only probably learn more, but you’d have the benefit of being able to say you had that mentor. I know for me, that would certainly have helped. So here’s hoping some of our local VMUG members take advantage of Rick (in a good way) and see if they can get in some mentoring time with some of the more senior VMware community guys. It’s not as bad as you think, and the room is usually filled with guys just like you. Let us (mostly Rick, let’s be honest ) know what we can do to help you out. We’d love to have you come and present at a VMUG and share “tales from the trenches” or “success stories” or “things I’m trying and aren’t working, maybe you guys know how to get past this” or even a “we’re looking at a new <x> and we’re trying to figure out how to best design/implement it – could we do a group whiteboard and aggregate the knowledge of the group”. Let’s put the community in the community! Here’s hoping it’s not some April Fool’s day joke, but the 2014 vExperts have been announced! I’m proud to be chosen for a second year in a row. Myself as well as Rick Byrne (@RickRByrne), one of my VMUG Co-leaders for the Edmonton VMUG, and Trevor Pott (@Cakeis_Not_ALie) appear to be the 3 that are Edmonton based. Looking to put your name in the hat? Starting this year, nominations and awards will be done quarterly. So head on over to http://www.jotformpro.com/form/40285638168967 and apply before June 6 2014. 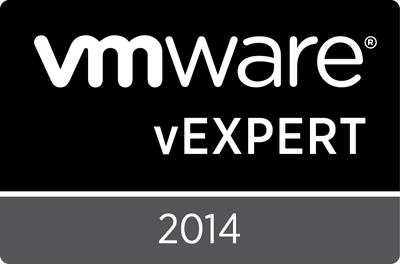 Congratulations to all the 2014 vExperts! Basically, they’ve offered to blanket sponsor all User Groups – VMUG was specifically called out, but I’m sure they’re open to any. User Group Leaders will get a free Annual Subscription – worth $299, with access to their entire library. 25 free Monthly subscriptions. So you could give away 2 each month with one left over, or 6 each quarterly event, etc. Any unemployed user group members can verify their employment status, and they’ll get a free Monthly subscription to get the training they need to help find employment. That’s amazing in my mind. First off as a VMUG leader, I really appreciate the annual subscription – mine gets a lot of use being a bit of a certification junkie. But the free give aways for the users in the user group is the thing I really appreciate – I love being able to give back to our community, and this is a great way to pass it along. So if you get a chance, click on the PluralSight logo on the right hand sidebar and go check them out. Sign up for a 3 day trial and drink from the firehose. Come out to an Edmonton VMUG and we’ll be giving away free Monthly subscriptions. Good afternoon everyone. I figured I’d collect some of the notes and updates I have for things new in October from the VMware community, as well as some Edmonton VMUG news. · Nov Meeting – we’re still working on lining up Chad Sakac and EMC to come out and talk. Our first date didn’t work out, but we’re very close to a new date that will work. Understandably, Mr. Sakac is pretty busy, and it takes some work to get things lined up just right. Looks like it might be Nov 20 at this point. For those who aren’t aware of Chad Sakac, he is EMC’s SVP of Global Systems Engineering. So the local SE’s we know and love (Jordan Heine) are ultimately part of Chad’s team. I’ve seen Chad speak, and above all I think one of the best things about him is his ability to not always be “All EMC, All the time”, but to really speak about the industry as a whole, pros and cons. A great speaker, with a ton of knowledge. · Dec – likely won’t have any activity, I’m sure we’re all busy enough with the holidays and end of year. · Jan Meeting – at the Edmonton VMware Forum, we were able to get Nimble and Brocade lined up to come out. Dates aren’t yet hammered out. · After a meeting with Pure Storage about their all flash based SAN’s, and a quick discussion about VMUG and Chad Sakac came up, they asked if they’d be welcome to present and if we’d be interested in having Vaughn Stewart present. Vaughn would be Chad’s counterpart, previously of NetApp, but having recently moved over to Pure Storage. We’re really excited for this possibility, as both of these guys are really cut from a similar cloth, and are industry evangelists. Having both in a year, would be amazing for the Edmonton VMUG. As his schedule will vary more than ours, we’re working on a time and date next year that will work. VMware recently announced the VMware Certified Associate certifications, which don’t require the VCP or its associated course. I’ve blogged about this at https://vnetwise.wordpress.com/2013/10/13/free-vmware-vca-certifications/ but the big news is that the 50% off until the end of 2013 exams are now also “the OTHER 50% off” for the month of October. This is a good way to get an introduction to certification quickly, easily, and cheap. Reach out to me if you want some study assistance, I’d be glad to help if I can. http://www.ivobeerens.nl/2013/10/01/watch-out-with-hardware-version-10-in-vmware-esxi-5-5/?utm_source=feedburner&utm_medium=feed&utm_campaign=Feed%3A+VirtualIef+%28Virtual+Ief%29 some folks, mostly home-labbers, are finding out that there is a catch-22 gotcha with ESXi v5.5. v5.5 introduces VMware Hardware v10 – which can only be _modified_ by the vSphere Web Client. As Free ESXi does not come with vCenter, users of Free ESXi do not have a means to EDIT VM hardware v10 hardware. You can still power it up, reboot it, etc., but you cannot modify disks, change NIC’s, etc. Something to be aware of if you go to deploy on Free ESXi. I’d recommend you either a) get familiar with editing VMX files, b) deploy the free vCenter VA, or c) look into vSphere Essentials Kit for ~$600 and have a full blown vCenter/vSphere installation – which gives you such features as Cloning, Templates, etc. http://kb.vmware.com/selfservice/microsites/search.do?language=en_US&cmd=displayKC&externalId=2057795 – keep this link handy for your upgrades. This will help you determine which pieces should be upgraded when. Remember that the typical rule is “largest” to “smallest” – so vCenter Server, then Hosts, then VMware Tools, then VMware Hardware, for a basic vSphere installation. If you’re using other VMware products such as vCloud Suite, vCNS, vCAC, View, SRM, etc, there are some additional caveats to handle first. Also don’t forget your 3rd party apps – Backup (eg: Backup Exec, vRanger, Veeam, etc), vCenter Integration (typically SAN’s – NetApp/EMC/Dell/etc/etc), monitoring applications (eg: SolarWinds, vCOPS, Veeam ONE, etc), these are usually the ones that slow you down – in my experience, it’s usually backup that seems to be last. · Any other application that might integrate – eg: your backup server, your vCenter intergration apps (eg: NetApp VSC, Dell vCenter Plug In), etc. This isn’t just to test the upgrade process – it’s to be able to give you a place to get some experience under your belt. Don’t let your first upgrade, be in production! http://kb.vmware.com/selfservice/microsites/search.do?language=en_US&cmd=displayKC&externalId=2060901 – if you’re cutting edge and all up to date like good girls and boys, you may have an issue. Turns out there is a problem with vSphere v5.5 SSO when your Domain/Forest is 2012 level and on 2012 DC’s (which should be a given). Something to be aware of, keep an eye on it. I haven’t been able to locate an IBM or Cisco customized ISO yet. Likely you can just upgrade using VUM with the upgrade ISO, then install the custom VIB’s as Host Extensions. That’s about it folks. I’ll try to post these more often, and do what we can to keep the community as active as possible!